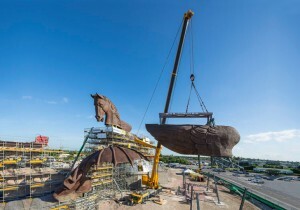 American crane service provider Allegiance Crane has used a Liebherr LTM 1400-7.1 mobile crane to lift the largest bronze horse statue in the world at a theme park in Florida. The bronze sculpture, named the Pegasus and Dragon, measures 33 metres high and 63 m long. It weighs 650 tons, 250 tons of which is bronze and 400 tons of which is the internal steel construction. The sculpture is welded together from 1,250 individual bronze plates. The sculpture has been created for the Gulfstream Park on Hallandale Beach, Miami, Florida, USA by German art foundry Strassacker. It took eight months to construct and is part of the $30 million Gulfstream Park theme park project, which is close to the internationally renowned Spring Racecourse. The bronze cast was made at the Strassacker Chinese foundry, south of Beijing. The sections were then shipped to Miami and assembled on site piece by piece. Engineering agency Stark Ingenieure was responsible for developing for the technical planning, including licence and permit application, support structure planning, workshop and assembly planning. The production and construction of the steel structure on site was carried out by Wendel steel construction of Donzdorf. In order to securely fix the bronze parts of the steel structure, a flexible mounting system suitable for the Florida climate was engineered. The system was designed to compensate for the different ways in which steel and bronze react when exposed to heat (bronze expands and steel remains rigid). The sculpture was also designed to withstand hurricanes. The 400 tonne capacity LTM 1400-7.1 was used to install the bronze components. It was configured with Y-guying system and full ballast. The heaviest component of the Pegasus was the left wing, which weighed 58 tonnes and was lifted at a radius of 22.3 m. The head of the Pegasus is made up of sections weighing between 45 and 50 tons. To overcome any potential problems during the task, the lifts had been planned on a simulator using 3-D data for the LTM 1400-7.1 supplied by Liebherr, a spokesperson added. The theme park is due for completion by summer 2015.